MERCATOR, G./ HONDIUS, J. - Taurica Cherso:nesus. Taurica Cherso:nesus. - MERCATOR, G./ HONDIUS, J. Size : 5.0 x 6.4 inches. / 12.8 x 16.3 cm. 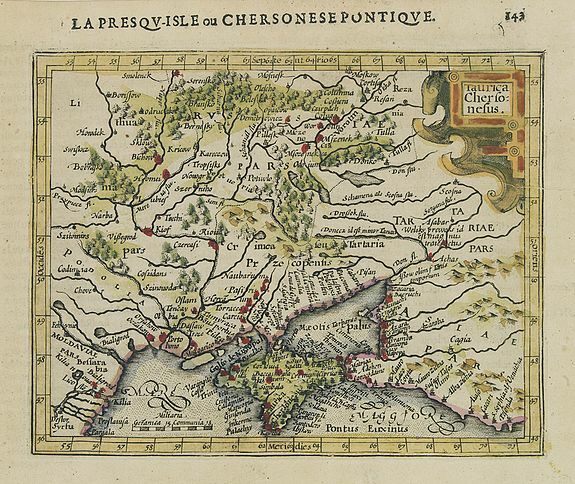 Description :Map centered on Ukraine, from the first French-text edition of Jodocus Hondius'' Atlas Minor. Shortly after the publication of the big folio-atlases the need was apparently felt for a smaller-sized atlas, one that would be handier and above all, cheaper. The Atlas Minor was larger in format than other small atlases available at the time allowing for significantly greater detail and more place names than found in its rivals. Condition : Paper slightly browned. Else good condition.